VANDENBERG AIR FORCE BASE, Calif. (Reuters) – The U.S. military test-fired its second intercontinental ballistic missile in a week on Thursday night, seeking to demonstrate its nuclear arms capacity at a time of rising strategic tensions with Russia and North Korea. The unarmed Minuteman III missile roared out of a silo at Vandenberg Air Force Base in California late at night, raced across the sky at speeds of up to 15,000 mph (24,000 kph) and landed a half hour later in a target area 4,200 miles (6,500 km) away near Kwajalein Atoll in the Marshall Islands of the South Pacific. Deputy Defense Secretary Robert Work, who witnessed the launch, said the U.S. tests, conducted at least 15 times since January 2011, send a message to strategic rivals like Russia, China and North Korea that Washington has an effective nuclear arsenal. “That’s exactly why we do this,” Work told reporters before the launch. Demonstrating the reliability of the nuclear force has taken on additional importance recently because the U.S. arsenal is near the end of its useful life and a spate of scandals in the nuclear force two years ago raised readiness questions. The Defense Department has poured millions of dollars into improving conditions for troops responsible for staffing and maintaining the nuclear systems. The administration also is putting more focus on upgrading the weapons. President Barack Obama’s final defense budget unveiled this month calls for a $1.8 billion hike in nuclear arms spending to overhaul the country’s aging nuclear bombers, missiles, submarines and other systems. The president’s $19 billion request would allow the Pentagon and Energy Department to move toward a multiyear overhaul of the atomic arms infrastructure that is expected to cost $320 billion over a decade and up to 1 trillion dollars over 30 years. The nuclear spending boost is an ironic turn for a president who made reducing U.S. dependence on atomic weapons a centerpiece of his agenda during his first years in office. Obama called for a world eventually free of nuclear arms in a speech in Prague and later reached a new strategic weapons treaty with Russia. He received the Nobel Peace Prize in part based on his stance on reducing atomic arms. “He was going to de-emphasize the role of nuclear weapons in U.S. national security policy … but in fact in the last few years he has emphasized new spending,” said John Isaacs of the Council for a Livable World, an arms control advocacy group. Critics say the Pentagon’s plans are unaffordable and unnecessary because it intends to build a force capable of deploying the 1,550 warheads permitted under the New START treaty. But Obama has said the country could further reduce its deployed warheads by a third and still remain secure. The Pentagon could save billions by building a more modest force that would delay the new long-range bomber, cancel the new air launched cruise missile and construct fewer ballistic submarines, arms control advocates said. Work said the Pentagon understood the financial problem. The department would need $18 billion a year between 2021 and 2035 for its portion of the nuclear modernization, which is coming at the same time as a huge “bow wave” of spending on conventional ships and aircraft, he said. “If it becomes clear that it’s too expensive, then it’s going to be up to our national leaders to debate” the issue, Work said, something that could take place during the next administration when spending pressures can no longer be ignored. Baghdad- Iraqi Prime Minister Haider Al-Abadi implicitly refused threats directed by Muqtada al-Sadr, who is a popular leader and a governmental official. Al-Sadr, during his Friday speech on Friday, before thousands of his supporters threatened that public enraged protest against corruption will break into the Green Zone. The zone notoriously goes by the Green Zone and is a 10-square-kilometer area centered in the Karkh district of Bahdad. PM Al-Abadi, in a press conference held by the parliament at al-Rasheed hotel and in cooperation with the U.N. delegation in Iraq, stated that the fight against corruption must be initiated within the parties themselves. He pointed out that no political party acknowledges its responsibility towards corruption in the country, “they all assign their ministers, force them on the Prime Minister, and then renounce them”, Al-Abadi added. At the conference, which was attended by Asharq Al-Awsat, Al-Abadi confirmed that political parties in Iraq were established either based on labels or on sects. Thus he called out on an initiative to form a comprehensive party that surpasses the limits of sects and figureheads. The new party should be able to overcome sectarian and social strife. “The reinforcement of democracy cannot be achieved because political parties are undemocratic themselves”, Al-Abadi said. The Iraqi PM also clarified that political parties strongly adhering to their ministers stands in the way of fixing the country. He asked that all influential parties begin with repairing their own-self, “it is not possible for us to fix the community, when parties are not competent themselves, it is not possible to further anchor the concept of democracy and freedom in the community, whilst our powerful parties are undemocratic and do not support freedom within their structuring” Al-Abadi explained. Many have already raised slogans that call for surpassing social, sectarian bridges rifting the society apart. However, nothing has yet been realized on ground, Al-Abadi added. Submitted by Nicole Wilson on January 22, 2010 – 3:07pm. [BestSyndication News] Earthquakes are always a concern out in Alaska and in California, as it is full of fault lines that are continually shifting. There are some fault lines that are overdue to shift, especially the California San Andres fault line that runs through the mountain ranges and close to Wrightwood. But did you know there is a United States Fault Lines Map that illustrates great potentials for earthquakes outside of our state? The New Madrid Fault Line has records of over 4000 earthquake reports since 1974. This fault line is also called the New Madrid Seismic Zone and has potential to devastate the states of Illinois, Indiana, Missouri, Arkansas, Kentucky, Tennessee, and Mississippi. The biggest part of the New Madrid Fault Line sits in Missouri. We often forget that this Midwestern fault line is there, but in 1811-1812 there was a series of earthquakes that shook with estimated magnitudes of 8.1 – 8.3, with several aftershocks of 6.0 magnitudes. Since those big ones, the largest earthquake that this fault line produced was in a 6.6-magnitude quake that happened on October 31, 1895. It’s epicenter was in Charleston, Missouri.The damage from these earthquakes were extensive, and there has been recent speculation by the scientific community that believe that this fault line might be shutting down and moving elsewhere. In an issue of Nature, scientist believe the current seismic activity at the New Madrid Fault line is only aftershocks from the earthquake back in 1811 and 1812. The Ramapo Fault Line spans 300 kilometers and affects the states of New York, New Jersey, and Pennsylvania. These faults run between the Appalachian Mountains and Piedmont areas to the east. This fault remains relatively inactive, but scientists believe that it could produce some serious earthquakes. There was a study completed in 2008 that believes a 6 – 7 magnitude earthquake will very likely occur from this fault line. The last time this fault was the most active was believed to be 200 million years ago. The last few years Southern California has been preparing for the next big one with government sponsored Earthquake Drills. Scientist are predicting that the next big one with a magnitude of a 7.0 or higher for this fault line will happen any time, it could be now or 10 years from now. They believe the areas that are going to be hit the hardest are going to be Palm Springs and a number of other cities in San Bernardino, Riverside and Imperial counties in California, and Mexicali municipality in Baja California. Is nuclear Armageddon more likely than ever? How many nuclear weapons are there? About 16,000. Russia and the U.S. have 93 percent of them, with more than 7,000 each; the rest are split between France, China, the U.K., Pakistan, India, Israel, and North Korea. The global stockpile is much smaller than it was at the height of the Cold War: In 1986, Russia and the U.S. had 64,000 nukes pointed at each other — enough to devastate every square inch of the entire globe. But there are growing fears that nuclear catastrophe is becoming increasingly likely. The established nuclear powers are modernizing their arsenals with smaller, more sophisticated weapons. The unstable regime in nuclear-armed North Korea is trying to develop a hydrogen bomb. ISIS, which is richer and more ambitious than any previous terrorist group, is trying to get hold of a nuclear device. The Doomsday Clock, the symbolic countdown to Armageddon, was last year moved from five minutes to midnight to three minutes. “We are facing nuclear dangers today that are in fact more likely to erupt into a nuclear conflict than during the Cold War,” says former Secretary of Defense William Perry. Probably North Korea, since it’s run by the erratic, belligerent dictator Kim Jong-Un. The Hermit Kingdom carried out its fourth nuclear test in January, and claimed it was a hydrogen bomb. Atomic bombs create their explosive energy solely through nuclear fission, while H-bombs rely on nuclear fusion, the same chain reaction that drives the Sun. This makes them vastly more powerful than atomic weapons: A-bombs tend to be measured in kilotons (equivalent to 1,000 tons of TNT); H-bombs in megatons (1 million tons of TNT). Nuclear scientists are unconvinced that North Korea’s underground test was a thermonuclear weapon, based on the shock waves it produced. But the country is believed to have built a 10-kiloton atomic weapon — slightly smaller than the Hiroshima bomb, but enough to destroy a city. The regime already has the capability to strike South Korea, Japan, and other nearby countries with nuclear weapons; its recent launch of a satellite into orbit, which was widely seen as an intercontinental ballistic missile test, suggested that it could soon reach the U.S.
What are other powers doing? Arming up. Russia’s defense budget has increased by over 50 percent since 2007 — a third of it is devoted to nuclear weapons. China is increasing its warhead stocks and developing nuclear-armed submarines. Pakistan and India’s own nuclear standoff shows no sign of cooling. President Obama, who in 2009 pledged to try to create a “world without nuclear weapons,” has proposed spending $1 trillion over the next 30 years updating America’s nuclear arsenal, replacing 12 nuclear-armed submarines, 450 land-based missiles, and hundreds of nuclear bombers. Some of the weapons in development are very controversial. They’re becoming smaller and more advanced, and thus more likely to be used. Last fall, the U.S. Air Force tested its first precision-guided atom bomb, which can be remotely guided like a cruise missile to zero in on small targets. Its explosive power can be dialed up or down, from 50 kilotons to 0.3 kilotons. Critics argue that nuclear weapons should never be used as battlefield weapons — only as a deterrent. “What going smaller does,” says retired Gen. James Cartwright, “is make the weapon more thinkable.” Russia’s new weapons are also causing concerns. Last November, the Kremlin leaked plans for a nuclear torpedo designed to sneak under traditional nuclear defenses and hit cities or military installations along the coasts. Could terrorists acquire a nuke? It’s possible. Between 1995 and 2012, the International Atomic Energy Agency catalogued 2,200 attempts to steal or smuggle uranium. ISIS’s propaganda magazine has suggested buying a nuclear weapon in Pakistan and smuggling it into the U.S. Nuclear experts warn that an improvised device could be fitted into an SUV-size shipping container. Ports and airports are fitted with radiation sensors, but they only work at very close range. Another potential threat is a “dirty bomb” — a regular explosive device that would spray radioactive material over a blast zone, exposing thousands of people to radiation and turning an entire city into an uninhabitable ghost town. Authorities in Iraq are now searching for a sizable quantity of “highly dangerous” radioactive material stolen last year, which theoretically could wind up in the hands of ISIS. Is a nuke-free world possible? Not in the foreseeable future. Once rogue nations develop nuclear weapons, they’re extremely unlikely to relinquish them. “The reason you attacked Afghanistan is because they don’t have nukes,” a North Korean diplomat told American negotiators in 2005. “That is why we will never give up ours.” For similar reasons, none of the nine nuclear powers will surrender its weapons. The nuclear genie was let out of the bottle in Hiroshima in 1945, and it will probably never be forced back in. Zushan Hashmi discusses the Turnbull Government’s recent unrestricted nuclear deal with India and the diplomatic ramifications for the South Asia region. THERE IS NO DOUBT that the civil nuclear deal recently signed by Australia and India, for the purpose of exporting uranium, has raised various important questions regarding the use of Australian uranium in India. Despite these questions being asked, various government officials have reassured the international and domestic community that the deal will build on the bilateral relationship between the two nations, through economic and strategic means. Yet, it is quite clear that there are various risks involved on Australia’s part, which in turn, can significantly hamper their geopolitical reputation and affect their bilateral relationships with other nations — potentially leading to instability in South Asia. In the past, Australia has considered exporting uranium to India, particularly under the Howard Government, only for the policy to then be revoked by Kevin Rudd. It was eventually reintroduced by Julia Gillard and then implemented by Tony Abbott. 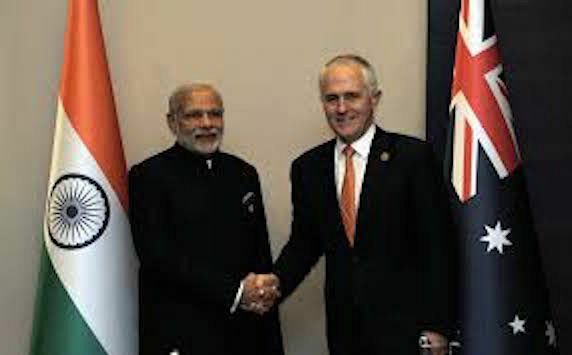 More recently, Malcolm Turnbull, who finally signed the deal along with Narendra Modi, has assured India that his government will follow through with the deal. However, lately there has been almost no further discussion on the matter from both nations. Australia’s aforementioned vacillation over the years is of no surprise though, as India is one of the four nations that have failed to sign the Non-proliferation Treaty (NPT). Over the years, Australia has always taken a strong stance against exporting uranium or having any form of uranium deals with any state that has refused to sign the NPT. However, due to India’s “good behaviour”, the safeguard agreement it signed in 2008 and the civil nuclear agreement between USA and India, Australia also opted to sign a deal to once again tap into its yellowcake reserves and eventually begin exportation to India. However, there have been doubts from several prominent leaders, the international community and the general public regarding the safeguards against nuclear proliferation in relation to the deal. Firstly, these safeguards or the lack thereof, have resulted in a largely unrestricted deal that can enable India to use the uranium for nuclear proliferation or at least aid with the proliferation of its nuclear stockpile. The blame, in this case, falls on the Australian Government, who went against the wishes of its joint committee to carry on with the agreement – and ignored existing loopholes in the safeguards – that may provide the opportunity for nuclear proliferation without India having to nullify the agreement or face repercussions. Furthermore, it is very likely that Australian uranium will also enable India to free up their existing stockpiles, so as to use them for their nuclear weapons program, as stated by the Australian Conservation Fundation’s David Sweeney in the past. This is now truer than ever, as Pakistan is on course to possessing the third-largest nuclear stockpile in the world (behind the U.S. and Russia). After all, it is well known that South Asia as a region has been heavily rocked by instability and insecurity. India and Pakistan have gone to war four times, and have also had several small-scale standoffs since the partition in 1947. Despite India’s economic rise and growing impact on global affairs today, it is still wary of several internal threats and of Pakistan — as often represented in its foreign policy. There is also always the possibility of militants slipping across the border from Pakistan and Afghanistan. Additionally, there is the risk of Pakistan’s nuclear arms falling into the hands of militants, or the aggressive foreign policies of both nations resulting in another war with the potential of going nuclear. The civil nuclear deal can lead to Australia to further fuelling these tensions in the region, which can force Pakistan to retaliate in protest and significantly hurt the steps India and Pakistan have taken in recent months towards reigniting talks. Moreover, this can result in an imbalance across the wider region, which is likely to displease China — Australia’s largest trading partner and ally in the Asia-Pacific. China, which has also invested significant sums of money into Australian mining companies, may be led to believe that Australia is taking a stance against China and its ally Pakistan, with the U.S. and India. On a positive note though, developments on the matter have taken a standstill in recent weeks, with no elaborations or further discussions on the civil nuclear deal. Then again, this is no surprise as it took a sizeable amount of time for the U.S. and India to reach their own civil nuclear deal. This is a great opportunity for Australia to consider the several alternative energy exportation means available to them that are just as likely to succeed and without risking regional instability in the Indo-Pacific region. These include solar and wind power and coalmining. Furthermore, strengthening the relationship in the education sector (a goal both countries continue to pursue) can also benefit Australia on a wider scale, as it will also keep China at bay. China, along with India, has one of the largest international student populations in Australia. It is vital that Australia rethinks the impact of exporting uranium to India while maintaining its strong bilateral relations with the country. The Government must also come to realise how this deal can affect the current dynamics of South Asia, the wider Indo-Pacific region and the perception of Australia across the global community. Regional instability in an already volatile region is the last thing Australia needs to get involved in. They came from the slums of this city’s underclass, the alleyways and the simple halls of the seminary in the Shia holy city of Najaf, and the outer reaches of the rural south. They waved Iraqi flags and demanded change. The crowd packed Baghdad’s Tahrir Square on Friday morning, chanting by the tens of thousands against corruption and for decisive reforms in how politics is conducted here, as they waited for their man to appear. Then Muqtada al-Sadr, the cleric and political provocateur whose command of the Iraqi Shia street is unmatched, stepped up to the rail of a makeshift stage on the rooftop of an old girls school and appealed to the people’s grievances in terms at once revolutionary and patriotic. “After today, the Prime Minister has to act!” he said. Referring to the barricaded heart of the central government, he said, “Today, we are at the door of the Green Zone, and tomorrow the people will be inside!” The time is ripe for demagogues again in Iraq, where the public is seething with anger over corruption, a grinding war and a collapse in oil prices that has shaken the economy. With an ineffective political class unable to rise above internal scheming, Iraq is struggling to face its most pressing concerns, the primary one being winning the war with the Islamic State and reuniting the country. Al-Sadr and his fearsome militia were once a primary enemy of the U.S., and he played many roles in shaping Iraq after the U.S. invasion: populist cleric, Iranian proxy, Iraqi patriot, political kingmaker. In seizing a chance on Friday to return to the political spotlight, he positioned himself as an Iraqi nationalist in the face of Iran’s growing role and as an ally to a weak Prime Minister. “Today I am among you to say to you, frankly and bravely, that the government has left its people struggling against death, fear, hunger, unemployment, occupation, a struggling economy, a security crisis, bad services and a big political crisis,” al-Sadr told the crowd. Above all, it was a reminder of al-Sadr’s complexity, and the confused state of internal Shia politics, that even as he was seeking to harness public rage against the political elites, he had actually called the street rally to support the reform policies of the country’s struggling Prime Minister, Haider al-Abadi. Al-Abadi’s proposal to tackle corruption and install technocrats in the country’s ministries has stalled over the opposition of powerful militia leaders and some pro-Iran politicians. For his part, al-Sadr has offered to have his ministers resign in protest to lend al-Abadi’s agenda some steam. Despite that, and the support of the most senior Shia cleric, Grand Ayatollah Ali al-Husseini al-Sistani, it remains unclear whether al-Abadi’s agenda will be able to win the help of any other political blocs. If nothing else, al-Sadr’s appearance in Baghdad on Friday was a chance to “get himself back in the centre of things,” said Kirk Sowell, an analyst based in Amman, Jordan, who publishes the newsletter Inside Iraqi Politics. Al-Sadr was once at the very heart of things in Iraq, but in recent years had receded somewhat from the public eye. When the United States invaded in 2003, al-Sadr was just shy of 30. But he drew on the political inheritance of his father, a pivotal and immensely popular Shia cleric assassinated on Saddam Hussein’s orders in 1999, to emerge as a powerful voice for the Shia underclass. He forged a movement that melded martial, political and social elements. His militia, the Mahdi Army, once fought the Americans and the Iraqi state, and it was blamed for atrocities during the sectarian civil war of 2006 and 2007. Nowadays his militiamen are largely under the control of the government, and his anti-Americanism, once a defining issue for him, is less ardent. Once an open client of Iran, al-Sadr has in recent years gone his own way, and is widely seen these days as an Iraq-first advocate of cross-sectarian unity. His militia, reconstituted after the extremists of the Islamic State captured Mosul in summer 2014, was renamed the Peace Brigades. Today, as he seeks to redefine himself once again, al-Sadr, now 42, has positioned himself as backer of al-Abadi, who is seen as increasingly weak in the face of the growing influence of Iran. Tehran supports al-Abadi’s political rivals, who command militias. Iraq is a place where everyone has his enemies, and al-Sadr has his share. One of his chief critics is the former prime minister, Nouri al-Maliki, who once counted on al-Sadr’s support to secure a second term after national elections in 2010. Al-Sadr later broke from al-Maliki, and tried to oust him from the premiership. Twenty-five years ago this week, on February 24, 1991, the first United States ground invasion of Iraq began. The first Bush administration had clear UN and congressional mandates to liberate Kuwait. More than thirty countries contributed ground forces, and the Soviet Union was a critical diplomatic partner. After a punishing six-week air campaign, the ground battle seemed to be over almost as soon as it had started, displaying the American military’s tremendous tactical and technological superiority. But amid talk of a new world order, the hundred-hour ground invasion was only the opening chapter in America’s tragic twenty-five-year Iraq story. Leaving Saddam in power was the correct decision, but it created a dilemma: what to do with an implacably hostile tyrant. As with Germany after World War I, Saddam had every incentive to challenge the postwar settlement. The economic embargo imposed to compel Iraq’s withdrawal from Kuwait remained after that withdrawal was complete. Because no real attempt was made to find a more durable postwar settlement—that would have constrained the Iraqi military and deterred chemical, biological and nuclear research, while mitigating the catastrophic impacts of a long-term full embargo—the diplomatic effort to sustain the sanctions regime was bound to increase with time. Thus, tactical postwar adaptations gradually calcified into contradictory policy objectives of containment and regime change. Saddam’s willingness to sacrifice his people’s welfare gave him a powerful diplomatic weapon in resisting sanctions and weapons inspections. By the time the George W. Bush administration took office in 2001, the sanctions regime was unraveling amid growing outrage at the profound suffering of the Iraqi citizenry. It is now understood that Osama bin Laden’s masterstroke was blowback against the American military deployment in the Arabian Peninsula. But the second Bush administration’s response was a foreign policy blunder matched in modern American history only by the Vietnam War. Saddam was removed from power in fewer than four weeks, but the incompetence of the occupation that followed defied comprehension. The simultaneous dismantling of the Iraqi army and the Baath Party exacerbated the devastation of decades of war and economic isolation, unleashing primordial forces that Washington struggled to comprehend, and that 150,000 American troops could not control. Terrorist organizations had long operated in the shadows of the Middle East. But only since the second invasion of Iraq have they been able to recruit thousands of foreign fighters to the heart of the region, control vast territory and engage in nihilistic destruction on such a grand scale. According to the Chicago Project on Security and Terrorism, an astounding 42 percent of the roughly 4,800 global suicide attacks since 1982 have occurred in Iraq, all of them since 2003. Before 2003, global suicide attacks averaged seventeen a year. Since then, they have increased by two thousand percent to an average of 370 per year. Like Nixon’s Vietnam inheritance, President Obama faced an untenable commitment for marginal strategic benefit as he entered office in January 2009. Nearly four thousand American soldiers had died and credible estimates of the war’s full costs ran as high as $3 trillion, while Iraqi leaders were no closer to resolving fundamental political divisions. Two months before leaving office, the second Bush administration signed a bilateral security agreement requiring American combat forces be withdrawn from Iraq by the end of 2011. Many believed the agreement would be extended, but President Obama was determined to fulfill his campaign commitment to complete the withdrawal. In December 2011, the withdrawal was completed and America’s war in Iraq—the second in two decades—was declared over. But this modicum of stability, too, proved illusory. The American military occupation was deeply unpopular among Iraqis, and the parliament was never going to provide legal immunities necessary to allow a large-scale American troop presence to continue. But despite tepid negotiations for a follow-on military presence, Obama gave the distinct impression he was content to take no for an answer. A more determined approach might have yielded a creative political mechanism for a limited, noncombat, follow-on American troop presence. Might the collapse of the Iraqi army against the self-proclaimed Islamic State (IS) in 2014 have been delayed or prevented? Certainly, Prime Minister Nouri al-Maliki’s unique incompetence belied the decades-long devastation of Iraq’s political culture. The reconstituted military and police retained certain dysfunctions that limited the effectiveness of their Saddam-era predecessors. On the other hand, Maliki’s most egregious blunder was the purging of Iraq’s senior officer corps, replacing them with corrupt cronies. An American noncombat military presence might have discouraged some of these worst sectarian impulses, improved accountability and ameliorated the sharp decline in morale. Instead, Iraq began again to fall apart, slowly at first, then more quickly as armed revolution began to shake Syria. Eventually this disintegration forced Maliki’s ouster, but not before the Iraqi army collapsed like a house of cards in Mosul in June 2014, against a vastly outnumbered IS force. By August, the American bombing of Iraq had commenced again. At it its core, the American experience in Iraq has been a failed twenty-five-year effort to address Iraq’s internal political dysfunction. The George H.W. Bush and Clinton administrations attempted this through an awkward balance of coercion, containment and, at least rhetorically, regime change. The second Bush administration undertook a disastrous imperial nation-building effort. The Obama administration was committed to disengagement until the declaration of a terrorist caliphate pulled it back in. With a new administration taking office in less than a year, three important lessons can be drawn from this most unhappy experience. First, the United States needs to dispense with ideological approaches. The hubristic excesses of the second Bush administration in attempting to recreate the Middle East are well documented. But the Obama administration was itself slow to adapt to changing circumstances. As a result, U.S. policy toward Iraq since 2003 has resembled an ideological pivot on the narrow question of the efficacy of military force. While the military’s overuse has repeatedly been demonstrated incapable of resolving underlying political problems in the Middle East, both neoconservative and neo-isolationist approaches have proven profoundly lacking. Meanwhile, an assortment of economic, political and diplomatic instruments is too often treated as an afterthought. Second, policy success is difficult to find where policy objectives are ill defined. Regrettably, the United States has lacked clear objectives in Iraq since Saddam’s eviction from Kuwait twenty-five years ago. As the borders between Syria and Iraq have been erased, the central locus for U.S. policy has shifted to Syria. In contrast with Putin’s ruthless focus on Assad’s preservation—which goes a long way toward explaining Russia’s relative success—American policies in Syria are every bit as contradictory today as in Iraq a decade ago. The next administration will have to clearly decide whether its overriding priority is the defeat of the Islamic State, the removal of Bashar al-Assad or ending the humanitarian catastrophe, since each requires a somewhat different approach. Third, and perhaps most importantly, the global policy community desperately needs tools to address the profound institutional deficiencies of the broader Arab world. The U.S. military has solutions that are often quite effective in addressing security threats and challenges. Unlike in 1991, however, the fundamental challenges in the Middle East today are primarily political in nature. The Islamic State’s terrifying emergence is rooted in decades of catastrophic governance failures in Syria and Iraq, which cannot be bombed away. Yet, after twenty-five years of near-continuous U.S. military engagement, Washington is no more competent today in supporting better governance, suggesting that the United States is likely to remain marginal to such efforts going forward. Addressing these institutional failings is central to the emergence of a more stable Middle East. An important starting point for the next administration is recognition of the magnitude of the challenge, understanding the relatively marginal role Washington will play, and appreciation for the profound tension between America’s short-term security needs and the region’s long-term reform needs. The U.S. invasion of Iraq in February 1991 marked the high water mark of American post–Cold War power. The Berlin Wall had fallen; the Soviet Union was existential nemesis turned partner; the demons of Vietnam vanquished. Yet for twenty-five years, four successive administrations have bequeathed grim inheritances to their successors involving this faraway desert land, hitherto marginal to American foreign policy. Eleven months from now, a fifth American administration will begin its own chapter with a happy ending nowhere in sight. Perry Cammack is an associate in the Middle East Program at the Carnegie Endowment for International Peace. Earthquake shaking in the eastern United States can travel much farther and cause damage over larger areas than previously thought. U.S. Geological Survey scientists found that last year’s magnitude 5.8 earthquake in Virginia triggered landslides at distances four times farther—and over an area 20 times larger—than previous research has shown. This study will help inform earthquake hazard and risk assessments as well as emergency preparedness, whether for landslides or other earthquake effects. This study also supports existing research showing that although earthquakes are less frequent in the East, their damaging effects can extend over a much larger area as compared to the western United States. The research is being presented today at the Geological Society of America conference, and will be published in the December 2012 issue of the Bulletin of the Seismological Society of America. The USGS found that the farthest landslide from the 2011 Virginia earthquake was 245 km (150 miles) from the epicenter. This is by far the greatest landslide distance recorded from any other earthquake of similar magnitude. Previous studies of worldwide earthquakes indicated that landslides occurred no farther than 60 km (36 miles) from the epicenter of a magnitude 5.8 earthquake. It is estimated that approximately one-third of the U.S. population could have felt last year’s earthquake in Virginia, more than any earthquake in U.S. history. About 148,000 people reported their ground-shaking experiences caused by the earthquake on the USGS “Did You Feel It?” website. Shaking reports came from southeastern Canada to Florida and as far west as Texas. In addition to the great landslide distances recorded, the landslides from the 2011 Virginia earthquake occurred in an area 20 times larger than expected from studies of worldwide earthquakes. Scientists plotted the landslide locations that were farthest out and then calculated the area enclosed by those landslides. The observed landslides from last year’s Virginia earthquake enclose an area of about 33,400 km2, while previous studies indicated an expected area of about 1,500 km2 from an earthquake of similar magnitude. The difference between seismic shaking in the East versus the West is due in part to the geologic structure and rock properties that allow seismic waves to travel farther without weakening. Learn more about the 2011 central Virginia earthquake. The global trade in arms continued to grow over the last half decade, buoyed by an appetite for weapons in the Middle East and a near doubling of exports from China. Figures released by the Stockholm International Peace Research Institute, a monitoring group, showed that even as the total trade in weapons grew by 14 percent between 2011 and 2015, the two largest exporters, Russia and the US, managed to capture even greater portions of the pie. American exports made up a full third of the global trade, up from 29 percent between 2006 and 2010. According to a congressional report, US arms sales increased by more than a third in 2014 alone, to $36.2 billion from 26.7 the year prior. SIPRI reported that over the last five years, the US sold “major” weapons to at least 96 countries — just a hair under half the total number of UN member states. Russia meanwhile captured a quarter of all exports in SIPRI’s most recent assessment, up from 22 percent in the previous reporting period. In line with longstanding security alliances in the Gulf, the US sent nearly 10 percent of its total exports between 2011 and 2015 to Saudi Arabia, and a further 9.1 percent to the United Arab Emirates. Both countries are members of the coalition that has intervened militarily in Yemen for nearly a year, largely with American-supplied aircraft and munitions. According to the Congressional Research Service, the US sold them more than $90 billion in armaments and weapons systems since 2010.